What’s the first thing that comes to your mind when you read this title? Are you thinking about the last time you got flowers at work? Are you thinking about the notes your mom sent in your lunch when you were a kid? Or perhpas you are remembering a moment when you were happily shocked by a stranger letting you go first in line at the grocery? This world is a crazy place. I’ve almost given up reading the news in the morning. (The morning routine used to be get up, have coffee – most important -, turn on the news.) Sometimes while sipping my life-saving java I would scroll through my news app on my cell phone and I could feel my mood (which is already not super since I’m not a morning person) plummet after a few minutes. How in the world are you ever supposed to go from reading this (see below) to having a positive and happy attitude with the rest of your day? So, I’ve started to swap from reading the news to checking Facebook or just catching up with my reading, and I think that I’m a happier person for it. I almost with there was a site that you could go to that would only list happy news – maybe stories about a volunteer in your community, a funny clip about the neighbor’s dog, or even a goofy riddle that makes you laugh out loud. 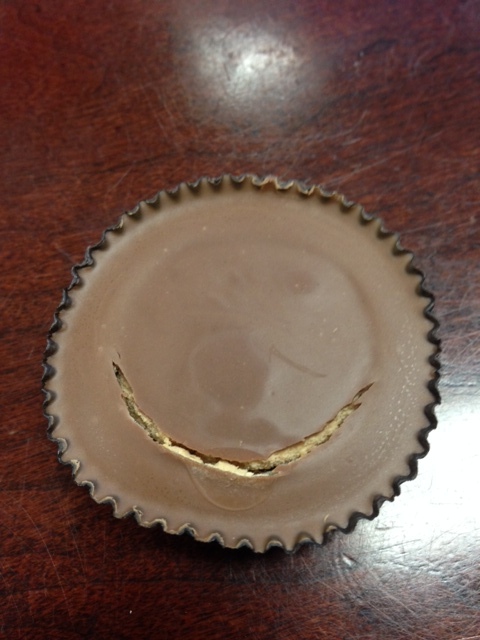 Look, my Reece’s is smiling at me – right before I ate him! In fact, this thought has led to an idea for a new book that I’m considering. It would be nonfiction, so something a little different than what I have been writing lately, but the idea has been circling; enough so that I’ve had little else to think about creatively. What about you? What’s your morning routine? Would you like to see something in the news that wasn’t so sad? Have you had any sweet surprises in your life lately that you wouldn’t mind sharing? Sweet surprises are always welcome. That peanut butter cup was happy because it knew it was doing its job–feeing you! 😉 A happy news channel would be so awesome! Make it so!